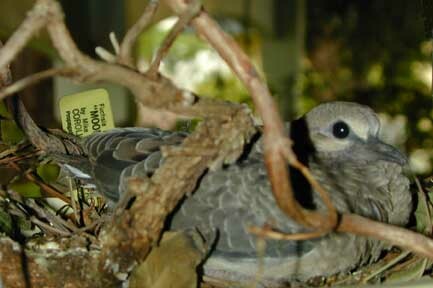 A pair of Mourning Doves built a nest in a hanging Fuchsia plant about six inches from my front door. They soon became accustomed to the routine delivery and retrieval of mail. The doves would simply sit there and watch me when I opened the door. However, they would take off suddenly when a stranger came to the door, flying within inches of the person's ear. To hear what that sounds like, click here. I decided to put up a warning sign when the sound of my doorbell followed by a terrified scream became a regular occurrence. Reaction to the "Beware of Dove" sign was an interesting study in HUMAN nature. The nest proved to be an excellent photo opportunity during the month the doves shared my doorstep.